Designed from the ground up with large family gatherings in mind, this 2,800 square-foot lake home has four spacious bedrooms, each over 200 square feet, and three spacious baths, the smallest over 70 square feet. In the main level, a 23 foot cathedral ceiling exposes oak beams and a tongue-and-grove oak ceiling, adding to the spacious feel of the 800 square foot Great Room. Two 8’ dining tables comfortably seat 16. 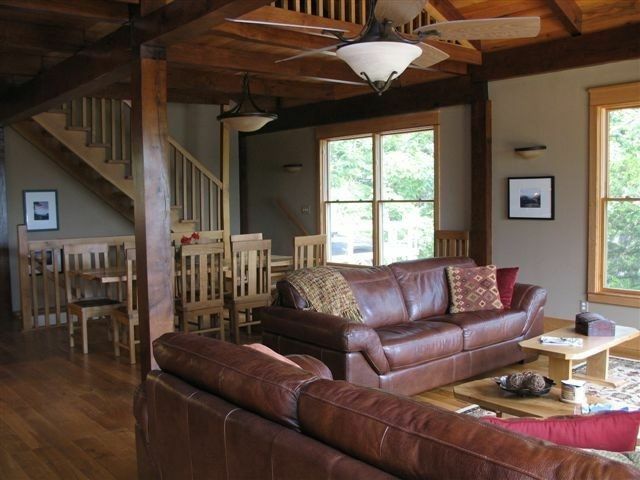 Two full-sized leather couches provide plenty of seating with a terrific view of the lake and woods. The television can be located in the lower level common area so the kids’ movie and game noises don’t interfere with conversation elsewhere. But it can be moved to the great room so everyone can enjoy a show together. The loft provides an extra sleeping area and has been the location of many spirited foosball matches. The 360 square-foot cedar deck feels like an extension of the Great Room because of the over-sized windows. The deck is pleasantly shaded by the house in the morning and by oak trees in the afternoon. Our home is built on 100 feet of heavily wooded shoreline and both our neighbors have double-wide lots of 200 feet, offering a nice secluded feeling, while other lots on the lake may be as narrow as 60 feet. You can keep your boat in our 10x28' dock slip. If you have more than one, ask, and I bet we can find a place for it. The dock also has a 300 square foot swim platform with a six-foot tall slide into the lake. And our cove location allows for safe, relaxing swimming away from boat traffic, while still providing a wonderful view of the lake and easy access to the main channel. Our VRBO is also a VRBBO (vacation rental built by owners), completed in July 2008. The project began with the owners, two brothers, cutting down dead oak trees, milling them into timbers, and then shipping the entire frame on a semi-trailer to the lake. It's been a family project the whole way with over 5,300 hours of volunteer work contributed by family and friends. Although it's been challenging at times, it's also been very rewarding, and we're excited to share the completed project with our guests. The main level, with access to the driveway and deck, includes the kitchen, dining area, living area, master bedroom, and bathroom. The entire main level is wheelchair accessible, including 36 inch doors throughout, a ramp from the driveway into the main door, and a grab bar next to the toilet. If someone in your group has difficulty with stairs, they will find everything they need conveniently located on the main level. The lower level consists of three bedrooms, all facing the lake, and two bathrooms. Located at mile marker 4 on the North Shore, this home is located 15 minutes or less from: Bagnell Dam, Lake Ozark, Osage Beach, HyVee, Wal-Mart, go-kart tracks, miniature golf, golf, shopping, health care, and a wide variety of restaurants and bars. A convenience store, with a surprising variety of goods, is less than two miles away. Adventure Marine is a good choice for boat and waverunner rentals, and it is located less than ten minutes away. Email or call Scott Ehredt using the contact information below for more information. We're sure it's just the place for making great memories with your friends and family. -Central air with separate thermostat setting for upper and lower levels. -Concrete driveway allows four parking spots (or 6+ if you double park). Additional gravel spots are available. -If you find anything in our listing that seems inflexible, let us know as we probably want to be more flexible but the options provided by the website won't allow us to both follow our business model and demonstrate our flexibility. Towels provided for only the first 16 guests. May through September. For other months, please ask. Two flatscreen TV's. One is small and easily moved from the lower level common area to the master bedroom, if desired. You can easily plug in your DVD, game console, or other input. So pretty and perfect from the house to the views. At night the lights on the water are spectular! Best I've stayed at, they have this house fully loaded with towels, blankets, beautiful quilts, the kitchen! This was perfect. Great house and area to stay. Owner was very helpful. This is a great house to stay with a group. Plenty of space and accommodations. Also a great area and close to a lot of things. No problems at all and would recommend to anybody. We stayed here for a corporate retreat and our only complaint is that it was not long enough! The photos really don't do this house justice, it is so well built and very clean. The kitchen was very well stocked for cooking and anything you could need. The house is SO large and truly can accommodate a large group very comfortably. We will definitely be back! This house was ideal for a group of 15 30-something guys getting out of their cities and into the woods for a while. It's clean, quiet, and everything you'd want or need. Without being too much or over the top. Communication was good. Lake access was perfect. Beautiful house with wonderful views of the lake. House had everything you could possibly need. Wonderful house for families with plenty of space. Can be challenging for older folks to get up and down stairs to dock and water. Overall loved our stay!! Thanks for the great review. We're quite pleased the house worked out for you. Regarding the walk to the dock, you definitely don't want to get to the dock and realize your forgot the sunscreen. For people where stairs represent a challenge, we recommend setting out a chair on the 8x8 landing in the shade halfway up. That way they can take a break in the shade before finishing the walk. If a person can do 2 regular flights of stairs, take a break, and then do 2 more flights, our place is doable. If not, there are still other options I can share with anyone who inquires. Located at mile marker 4 on the North Shore, this home is located 15 minutes or less from: Bagnell Dam, Lake Ozark, Osage Beach, HyVee, Wal-Mart, go-kart tracks, miniature golf, golf, shopping, health care, and a wide variety of restaurants and bars. A convenience store, with a surprising variety of goods, is less than two miles away. Adventure Marine and Bombay boat rentals are good choices for boat and wave runner rentals, and they are located less than ten minutes away.